TMT and Lytic are maintained by the Electro- Optical Systems Lab at the Georgia Tech Research Institute. GTRI is the applied research arm of Georgia Tech. The product lead is Edward Clarkson, and Greg Rohling leads the branch that maintains Lytic and TMT. By downloading and/or utilizing this Program, you agree to become bound by the terms and conditions of this license. If you do not agree with the terms and conditions set forth below, do not use TMT or Lytic, or any portion therof in any form or manner. This Program (TMT or Lytic) is licensed, NOT SOLD to you (“User”), by Georgia Tech Research Corporation (“GTRC”), owner of all rights and title to the code and accompanying documentation (“Program”) for use under the terms and conditions of this License. As such, GTRC reserves any and all rights not expressly granted to User under this License. With respect to the Program to which GTRC has exclusionary rights, GTRC hereby grants to User a nontransferable, non-exclusive license to use the Program for User’s own internal, non-commercial purposes only. User shall not distribute, release, or disclose the Program to any other person or entity and shall ensure that no one will be allowed to take or send the Program to any other location, unless written permission is obtained in advance from GTRC. No authorization to alter, adapt, modify, translate, decompile, transform, or reverse engineer the Program is granted. GTRC shall have the right to terminate this Agreement and/or License without cause at any time. This License will terminate immediately without notice from GTRC if User fails to comply with any provision herein. Upon termination User must destroy the Program and all copies, including partial copies, thereof. User accepts the program on an "as is" basis. GTRC makes no representation or warranty that the program will be accessible or downloadable. GTRC makes no warranty that all errors can be or have been eliminated from the program. GTRC shall not be responsible for losses of any kind resulting from the use of the Program and its accompanying documentation, and can in no way provide compensation for any losses sustained, including but not limited to any obligation, liability, right, claim or remedy for tort, or for any actual or alleged infringement of patents, copyrights, trade secrets, or similar rights of third parties, nor any business expense, machine downtime or damages caused by User or any deficiency, defect or error in the program or malfunction thereof, nor any incidental or consequential damages, however caused. GTRC disclaims all warranties, both express and implied, respecting the use and operation of the program and its accompanying documentation, including all implied warranties of merchantability and fitness for particular purpose and any implied warranty arising from course of performance, course of dealing or usage of trade. GTRC makes no warranty that the program is adequately or completely described in, or behaves in accordance with any accompanying documentation. GTRC makes no warranty or representation, either express or implied, with respect to the program and its accompanying documentation, including its quality, performance, merchantability, or fitness for a particular purpose or use or that the use of the program or its accompanying documentation will not infringe any patents, copyrights, trademarks, or other proprietary rights. User of the Program is expected to make the final evaluation of The Program's usefulness in User's own environment. GTRC shall have no obligation for support or maintenance of the Program. GTRC shall have no obligation to provide error corrections and updates or any other modifications to the Program. All software should be used at your own risk! To install and use, unzip the archive to any location; run lytic.exe in the extracted folder. The archive should auto-extract in your downloads folder; run the application from there or copy it to your applications folder. NOTE: the current beta version is NOT signed, so it will likely be blocked from running the first time. After it is blocked, go to System Preferences > Security & Privacy pane and click the "open anyway" button (you'll have to repeat this process every time you download a new version). How is Lytic related to TMT? Lytic is a standalone version of the TMT data analysis component, with a front end that ingests CSV (character separated value) files rather than TMT matrix data. They otherwise share the same code base, so improvements to one (e.g., improved visualization or performance) are shared by both. Is Lytic Open Source? Can I get the source code? We are currently evaluating the possibility of making Lytic open source. However, we do not have the necessary permissions (internal, government, sponsor) at this time. What are Lytic's licensing terms? As with the open source question, we are currently evaluating current and future licensing terms. Our preference is to maintain a free/community version with the potential of a paid "Pro" version with additional capabilities/features. Cost, of course, is TBD. Until then, enjoy the free public version. What is Lytic's export classification status? Lytic has been given an Export Control Classification Number (ECCN) of EAR99 by the U.S. Dept. of Commerce and is not subject to ITAR/U.S. Munitions List restrictions per the U.S. Dept. of State. Lytic screenshot (click to enlarge). Lytic is a freely-available tool for exporatory data analyis. 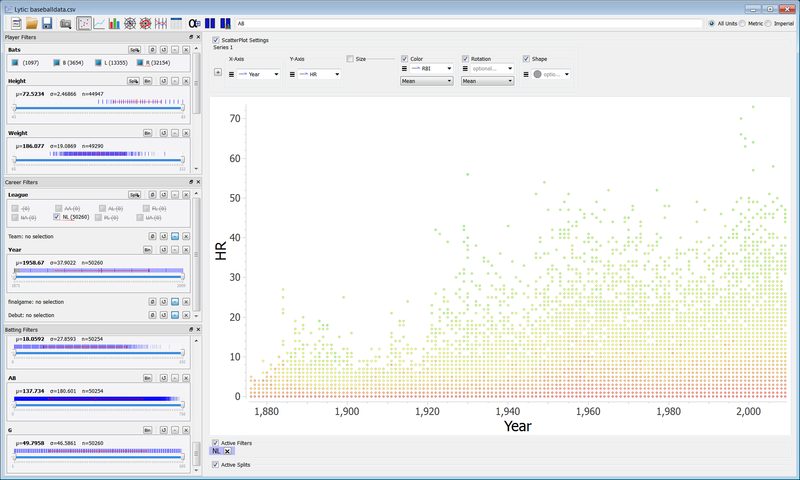 It is a spinoff of the Test Matrix Tool and thus was originally developed for analyzing large simulation datasets. We call it a scientific intelligence tool: similar to business intelligence tool, it provides insight into scientific data through visualization and filtering. We have used it as both a production tool for engineering analysis efforts in EOSL and as a research platform with collaborators in the Georgia Tech School of Computational Science and Engineering (see our paper at the SIGKDD IDEA 2013 workshop). Lytic ingests CSV data and caches it in an SQL database in a manner conducive to OLAP-style querying. It dynamically creates UI elements from the characteristics of the data themselves, and optimizes user data requests (visualization, filtering, etc.) to maximize UI update speed. The UI has been designed with a particular focus on ease of end-user operation, so that obvious semantic operations on data (filtering, comparisons, mapping to simple visualizations) are straightforward. The database cache can be either an embedded sqlite or more recently a column-store MonetDB database; the latter improves UI responsiveness dramatically for larger dataset sizes. All content © 2019 Georgia Tech Research Corporation. All rights reserved.